If you’re in the market for life insurance, the first decision you are going to face is whether you want to buy a term or whole life policy. While the difference between these two options may seem trivial at first, it is actually pretty important. In the long run, choosing the right policy for your circumstances could save you big money without sacrificing your life insurance needs. So, before you settle on one or the other, it’s a good idea have a thorough understanding of both types of life insurance, their costs and their benefits. We’ll get into all of that, but first, let’s figure out what each of these terms means. The defining feature of a term life insurance policy is that it lasts for specific period of time—a term. This can range from as few as five to as many as 30 years, but a typical period for a term policy is 10 years. During that time, the policyholder pays an annual premium, and if he or she dies within the period, a death benefit is paid out to the beneficiaries of the policy. The cost of the premium depends on the size of the death benefit, and is calculated by a special formula developed by the insurance company. This is a little grim, but here’s how it works: the formula approximates the probability that the policyholder will die during the term, based on the policyholder’s age, health and other risk factors. The higher that likelihood, the higher the chance the death benefit will be paid out and consequently, the higher the premium. It’s similar to car insurance companies that charge bad drivers more because they are more likely to get in an accident. The more likely you are to die during the term, the more you will pay in premiums. If the policyholder reaches the end of the term without dying (hooray! ), then no death benefit is paid. In some cases, the premiums paid throughout the term are returned to the policyholder in a lump sum. This is called a return of premium policy, and is far more expensive than a standard term policy, since the policyholder essentially has a money-back guarantee. Whether it’s a return of premium or standard term policy, once it’s over, it’s over. If the insured wants to maintain coverage, she will have to buy a new policy. Most term policies are level, which means the policyholder pays the same premium each year throughout the term. Contrast that to annual renewable term policies, which require renewal each year, with premiums adjusting upon each renewal. Other varieties on the standard level term policy are decreasing term insurance, in which the death benefit decreases over time, and increasing term insurance. We will focus our comparisons from here on out on level term insurance, since it is most common. When it comes to types of life insurance, term may be the most popular but it’s not the only option. In contrast to term life insurance, whole life insurance policies do not define a time period during which they are in effect. That is to say: a whole life policy is a form of permanent life insurance. Coverage does not expire, and the death benefit is guaranteed, as long as you continue paying premiums. 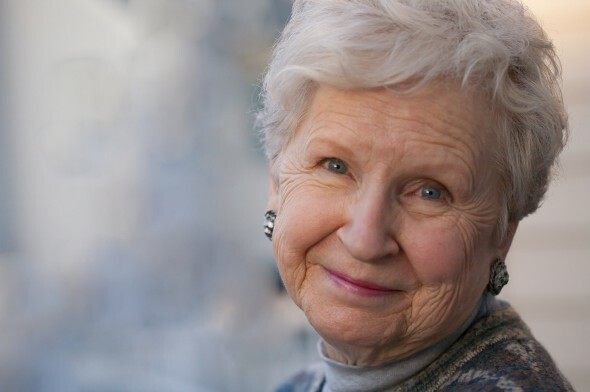 (Technically, coverage on current policies lasts until the policy holder reaches the age of 120—if you think you may live even longer, check with your insurer to see if you will receive benefits beyond that age). As with term insurance, there are varieties of whole life insurance that have adjustable premiums and benefits, but for most whole life policies, annual premiums are level for the duration, regardless of changes in the policyholder’s health. This is one of the most important aspects of a whole life plan: the premium you agree to pay today, when you are young and healthy, is the same premium you will pay in 40 years. Eventually, the premiums paid by the policyholder are not enough to fund the potential payout of the death benefit. As a result of this, insurance companies are required to accumulate a cash reserve during the early years of a whole life policy. The purpose of this reserve is to ensure that the full death benefit can be paid out (without it, insurance companies could sell policies now that they can’t back later), but it also gives rise to some additional benefits for the policyholder. Most insurance companies allow policyholders to borrow against their cash reserve or to use it to make premium payments. This is a nice perk, but it comes with several caveats. For starters, any money you borrow and do not pay back will be deducted from the death benefit eventually paid to your beneficiaries. Despite that, you are still required to pay interest on the loan, either out of your own pocket or out of the cash reserve, further depleting the benefit. Some whole life plans also offer policyholders a dividend—an annual payout that comes out of the insurance company’s profits. Dividends are not guaranteed, but some companies have a long track record of reliably paying them out each year. That is the million dollar question. 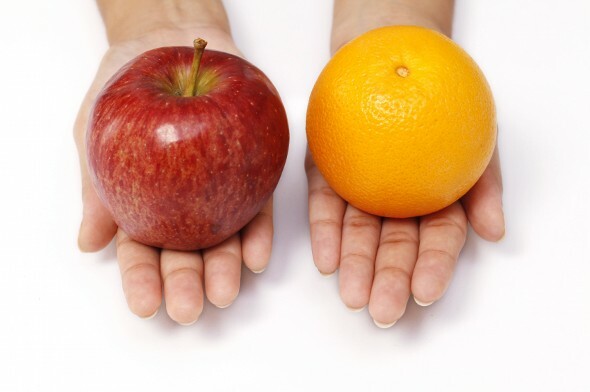 Before we answer it let’s do a side by side comparison of the two types of life insurance, whole life and term, so we can easily see their features. The table below contains most of the major elements of any life insurance policy, and whether each one applies to term, whole life or both. As you can see, while they both offer a death benefit, term and whole life policies really serve two distinct purposes. Term policies offer the lowest premiums, but coverage only lasts for a fixed amount of time. On the other hand, whole life is more expensive, but coverage is permanent. Whole life also has some financial features that may appeal to you. We’ve looked at the two main life insurance types here, but there are different types of life insurance policies that don’t get as much attention. There’s the sometimes controversial corporate-owned life insurance, in which an employer will take out a policy on an employee. Then there’s stranger-originated life insurance, in which someone with no personal or professional relationship to a policyholder can become the beneficiary of that person’s life insurance policy. Another obscure life insurance type is the unit-linked insurance plan, which combines life insurance features with investment. 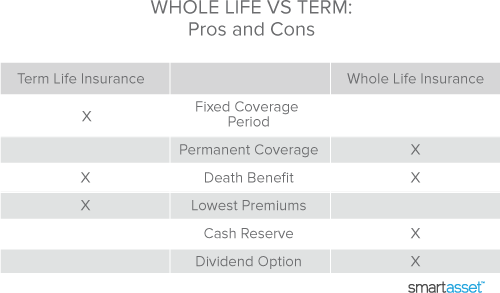 For the average consumer, however, any comparison between types of life insurance will likely come down to the term vs. whole life decision. This all comes down to your personal life insurance needs. If you want life insurance for the next fifteen years, while you have an obligation to pay off a mortgage, then a term policy probably makes more sense for you. On the other hand, if you want long term coverage to help your spouse with any potential funeral costs, a whole life plan may serve you better. Whatever your personal circumstances, you’ll need to figure out your desired death benefit, and the length of coverage that you want. With those two numbers in hand, you can determine which of these types of life insurance—term or whole life—makes sense for you. Then you can look into how much life insurance you need.